What started as an act of bravado to impress a woman led to a 30-year relationship, not with that woman, but with a country Daniel Eiben '64 fell in love with. "In 1988, I impulsively volunteered to go to El Salvador, hoping to get her attention. She didn't notice, but the experience I had there changed my life forever." The 1980s and early 90s was a time of civil war in El Salvador. "Although I was already involved in the El Salvador solidarity movement, actually going there in wartime exposed me to the reality of daily life in difficult - and dangerous - conditions. I witnessed first-hand their poverty and struggle for basic human rights which we take for granted. Their courage and strength in the face of brutal repression really struck me. But the faith of the Salvadorans and the example of their martyrs, such as Rutilio Grande SJ, Blessed Oscar Romero, and the four North American religious women, to name but a few, brought me back to the Faith after a 20-year separation." 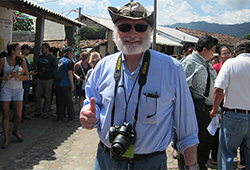 It was in Mr. Bill Davis, SJ's freshman History class at Prep that Daniel first learned about the struggle for social justice in Latin America when a visiting Jesuit told students of a war, in part fomented by international oil companies, that was waged between Bolivia and Paraguay in the 1930s. As a teenager, the injustice almost made his head explode. As he continued learning about Central and South America over the following years, he transitioned into an advocate, and later an activist. After that first visit in 1988, Daniel deepened his involvement in both the solidarity and sanctuary movements and took a deep pay cut in 1990 when he left his job as head of training for Ernst Hardware to become the Executive Director of the Central America Peace Campaign. Over the years, Daniel has returned to El Salvador four times, most recently in 2016. In the early 1990s, as a member of St. Patrick's Parish, he helped establish their sister parish relationship with Nueva Trinidad in the war-torn northern region of El Salvador, a partnership approaching its 25th anniversary that has deeply transformed both communities. Daniel grew up in Cleveland. The family moved to Seattle when his father accepted a residency in pediatric neurology at UW. Daniel remembers taking the bus from Laurelhurst over the bridge and walking up "Jesuit Hill" every morning. "We weren't the bad kids; just the ones who got caught." Sneezing powder became briefly popular during Daniel's sophomore year. Fr. James Hess, SJ used to lecture as he wandered the classroom, but wasn't always fully aware of his surroundings. At least three students simultaneously tagged him with powder during one class and he sneezed so hard, he loosened his Roman collar. Still unaware, he told students he was coming down with a cold. But Fr. Donohue, SJ the Vice Principal and Prefect of Discipline, knew exactly what had happened! "Hacks" were duly administered. In what he jokingly refers to as "an act of flagrant premeditated child abuse" Daniel's parents tore him away from Seattle to move back to Cleveland the summer before his senior year. 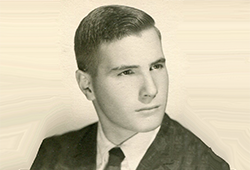 He planned to live with classmate and good friend Dudley Cox's family until Fr. Seaver, SJ found out and nixed the plan. Dr. Eiben, a polio specialist early in his career, was so convinced of the Salk vaccine that he entered Daniel and his brothers into the first Salk vaccine trials in the early 50s. He was known for his tender care of young patients and attention to family dynamics around an illness that often brought isolation. That compassion wasn't lost on Daniel. Daniel embodies this sense of "cura personalis" in his own work today at the Urban Rest Stop. As a member of the JVC Northwest EnCorps program, Daniel volunteers twice a week downtown. "My first task was scrubbing the showers in between clients. I channeled Pope Francis as I worked, determined that it would be sparkling for every client to use it. When you're homeless, a clean shower - anything clean - takes on a whole new meaning." Daniel returned to Seattle from Cleveland in 1983, reconnecting with the deep roots he built at Seattle Prep. When he rode the #7 bus down 10 th Ave to his job that September, he realized that his two wildest dreams about Prep had come true: students could wear jeans and girls had enrolled. Today he is a member of Immaculate Conception Parish in Seattle and one of very few white members of the Knights of St. Peter Claver, a black Catholic fraternal organization. He is also a member of Seattle Prep's Panther Legacy Society, a group of individuals who have included Prep in their estate. "As a single man who never married, I am able to think about my legacy in a different way. I'm choosing to share that legacy with the individuals and organizations that touched my life, including those in El Salvador and Seattle Prep." "Although I actually graduated from St. Ignatius in Cleveland, Prep is my school! It gave me lifelong friends whom I still get together with regularly and, unlike so many others who have moved here from away, allowed me to sink deep roots in this city I so love. More important, it provided an environment where I was able to begin developing analytical and communications skills, especially from years of studying Latin and Greek, which have served me well over the years. Moreover, the Jesuits instilled in me a love of learning and invaluable critical thinking skills." Daniel is especially proud that today's Seattle Prep students demonstrate companionship, a willingness to simply be present with another person whose circumstances may be different from their own (without trying to change those circumstances) on immersion trips to the Dominican Republic, New Orleans, and this year, to Appalachia, Vietnam and Cambodia. "I support Prep because, in a 'post-factual' age in which truth has become 'truthiness' and the main purpose of an education is nothing more than job training, Prep's truly countercultural commitment to developing graduates who are open to growth, intellectually competent, spiritually alive, loving, and committed to justice is more important than ever. I am blessed and grateful to be able to support that commitment, although I wish Prep would bring back Latin and Greek."